Tales of a Wayside Inn is pretty much just a collection of Henry Wadsworth Longfellows' poems, put together in story (or poem, if you want to be technical) format. For the most part I enjoyed it, but for me, the Saga of King Olaf, one of the poems, was a little slow. I couldn't keep up with what was going on.Anyway, it definately inspired me to read more poetry, although, finding someone else who writes poetry like Longfellow, might be difficult. An unexpected pleasure! It's been forty or fifty years, since I last read Longfellow, the most celebrated American poet of his time now much neglected, and at least two decades since I abandoned the rhymed poetry camp for a freestyle poetry preference, so I did not expect to enjoy my long immersion in "the well-made poem" quite so much. Astonishingly, I did -- very much so. Perhaps it's long immersion that makes the difference, but the stories are engaging, as well. This miniature cycle of tales in verse owes much to Chaucer's Canterbury Tales and Boccaccio's Decameron. At least one story I recognize from the latter. The narrators are also well-wrought and engaging, and Longfellow's verse is smooth as glass, yet varies in pattern from tale to tale. Often, you can hear them as actual songs, each different from the next. Perhaps that's why the rhyming doesn't pall. I can't guarantee everyone will come away quite charmed as I was, but, if you're a fan of rhymed poetry, Chaucer or Boccaccio, you might give it a try. I'm not normally big on poetry but I absolutely loved this! Between the eloquent rhyming and the imagery, Longfellow breathed life into each tale and the tellers of those tales. Highly recommended for poetry lovers and novices alike! I smuggled this tiny book of Longfellow's poetry (that I found and was saving for just such a time) into my graduation ceremony. It was a very, very long ceremony. After finishing "Evangeline," I looked over a list of Longfellow's works to see what I should read next. The answer was clear! My in-laws have a tradition of going to the Wayside Inn in Sudbury, Massachusetts, for special dinners. I've gotten to go there with them once myself. So there was no question I had to read "Tales of a Wayside Inn," set at that very establishment!Longfellow uses a similar format to the Canterbury Tales or Decameron. There is a gathering of guests at the Wayside Inn, and each tells a story before retiring for bed. Each tale takes its own form, letting Longfellow try various meters and rhyme schemes. The first tale was none other than "Paul Revere's Ride." Others are set in Italy, Spain, and Norway. Some are very short, while the Saga of King Olaf is in 22 parts. At the end of the book, there are a few short poems that seemed otherwise unrelated to the main part. These didn't grab me as much as the tales. Next up in my survey of Longfellow is "The Song of Hiawatha." Beautifully written. I don't understand why we didn't read more Longfellow when I was in high school! I trying to fill some holes in my reading of American literature. When I was in Boston recently, I visited the Henry Wadsworth Longfellow National Historic Site in Cambridge. This house served as George Washington's headquarters during the siege of Boston (although I am told that there are buildings scattered throughout the region that claim to have served as Washington's HQ). But it is most famous as the residence of Longfellow and his family. Remarkably, the family preserved all of the original home and furnishing until it was given to the National Park Service. I was so pleased with my visit that I purchased a copy of Tales of a Wayside Inn.This long narrative poem is a frame story. Several acqaintances are spending the night at the Red Horse Inn in Sudbury, MA (now renamed "Longfellow's Wayside Inn"). These include the Landlord, the Poet, the Sicilian, the Theologian, The Musician (a Norwegian), a Spanish Jew, and a Student. Each of these characters takes turns telling a story. The debt to Chaucer's Canterbury Tales is obvious. In fact, Longfellow first wanted to call this collection "The Sudbury Tales." The most famous poem here is "The Midnight Ride of Paul Revere," told by the Landlord. The rest are a miscellany of stories from a wide range of sources. Because of my interest in Scandinavia, I was interested "The Saga of King Olaf" (told by the Musician). And I was particularly struck by "The Birds of Killingworth," which has a strong environmental message and foreshadows Rachel Carson's *A Silent Spring. *Longfellow contributed the phrase "two ships that pass in the night" to the English language. It comes from these poignant lines from the tale "Elizabeth": "Ships that pass in the night, and speak each other in passing/Only a signal shown and a distant voice in the darkness;/So on the Ocean of life we pass and speak one another,/Only a look and a voice, then darkness again and a silence." Similar to The Canterbury Tales in its setting and style, Tales of a Wayside Inn by Longfellow is a cool little book. A group of travelers and bar patrons take turns and tell their favorite tales. My favorite was the charming Student's Tale, that had an ironic twist, while the Musician's Tale was a bit too long and tedious. Overall, the group of various tales was a real treat. Longfellow is entertaining, and his writing style is so smooth and pleasant, like taking a long, easy walk through a bird-filled woods on a warm spring day. Although the description of this book says that "Longfellow's Wayside Inn in Sudbury, Massachusetts, originally known as Howe's Tavern, , was the inspiration for Longfellow's widely read book of poems", I this it more accurate to say that Geoffrey Chaucer's Canterbury Tales was the inspiration and that the Wayside Inn was his backdrop. Interest, and worth more than one encounter. Read as an audiobook. You will recognize the Midnight Ride of Paul Revere, but there are many lesser-known gems in this volume. The setting and the characters who meet at the Inn (a real place in Massachusetts) are vividly drawn and compelling on their own. Some of the language can be a bit of a slog, and there are a couple of disturbing or melancholy tales if you are sensitive, but the Inn is well worth a visit. I started reading this book in the mid-1990s. My favorite poem at the time was -perhaps the most famous - "Ride of Paul Revere." However, over the years I have re-read it a few times and come to appreciate the other tales. Today, Longfellow seems to be a nearly forgotten name on the whole, and perhaps as cliche as Poe in literary circles. Hopefully, he'll come back in style soon. A modern "Canterbury Tales" fit for American tastes, complete with "The Midnight Ride of Paul Revere." Contains also "The Saga of King Olaf," (Theodore Roosevelt's favorite poem) the longest section of the book and the least enjoyable to me. But the book is worth reading if only for "The Spanish Jew's Tale: The Legend of Rabbi Ben Levi." "I have you fast in my fortress,And will not let you depart,But put you down into the dungeonIn the round-tower of my heart.And there will I keep you forever,Yes, forever and a day,Till the walls shall crumble to ruin,And moulder in dust away!" I found some tales to be fantastic and some to be dreadfully boring. This is by no means a criticism of Longfellow's writing, however. My distaste for some of it is merely a result of my personal preference in subject matter. The more mythical tales simply did not particularly interest me. Had to read this collection after visiting the inn.......connecting the real place with the literature is a wonderful experience. Some really excellent tales (some middling tales as well), but the one on King Olaf nearly did me in. Love his other works better. 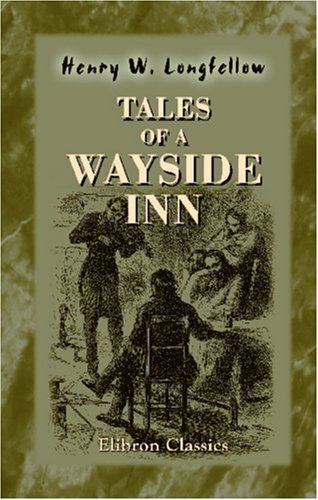 I hope (someday) to make a little stay at the Wayside Inn, in Sudbury, Mass., and while there, read Tales of a Wayside Inn by Henry Wadsworth Longfellow. Reads like Chaucer for Americans. Makes me want to memorize and recite. Make sure you read the last tale, Birds of Killingsworth. Imagine a world without birds. I picked this up when I stayed at the historic Wayside Inn and enjoyed reading about the "stairways worn, and crazy doors, and creaking and uneven floors" while I walked on the same. Henry Wadsworth Longfellow - Henry Wadsworth Longfellow was an American poet whose works include "Paul Revere's Ride", The Song of Hiawatha, and "Evangeline". He was also the first American to translate Dante Alighieri's The Divine Comedy and was one of the five members of the group known as the Fireside Poets.Longfellow was born in Portland, Maine and studied at Bowdoin College. After spending time in Europe he became a professor at Bowdoin and, later, at Harvard College. His first major poetry collections were Voices of the Night (1839) and Ballads and Other Poems (1842). Longfellow retired from teaching in 1854 to focus on his writing, though he lived the remainder of his life in Cambridge, Massachusetts in a former headquarters of George Washington.Longfellow predominantly wrote lyric poetry, known for its musicality, which often presented stories of mythology and legend. He became the most popular American poet of his day and also had success overseas. He has been criticized, however, for imitating European styles and writing specifically for the masses.